Here is the easiest entrance to the large variety of camping sites in Denmark. In the control panel at the left there are 5 topics under which you will quickly find the camping site you are searching for. At Camping.dk under Company/City Indexes, you will find local indexes covering the attractions and sights etc. that the local area has to offer. Look further here. Read about Top 10 Topics prioritised by many people when choosing a camping site for both short and long camping holidays in Denmark. There are more than 500 camping sites in Denmark and therefore ample possibilities of finding a site close to or in a beautiful countryside. Denmark and its many islands have a coastline of more than 7,000 km, so .. Look further here. Your children are often the best reason for choosing a camping holiday, if you also want to relax and maybe indulge in some adult time. 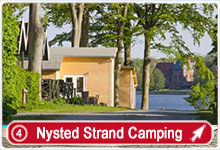 For many years, camping sites in Denmark have focused on children, so .. Look further here. If you do not bring your own equipment for accommodation, the Danish camping sites provide a great variety of accommodation facilities, ranging from...Look further here. Denmark is one big water world with facilities in and outside the sites to satisfy the needs of most visitors. In the sites you will find children’s pools, heated swimming Look further here. playing in play ... Look further here. the 500 camping sites in Denmark offer wireless ... Look further here. speaking of site quality. 2/3 of the Danish camping sites carry 3 stars or more. used for regularly evaluating Danish camping site ... Look further here. season. Costs such as pitch or ... Look further here.